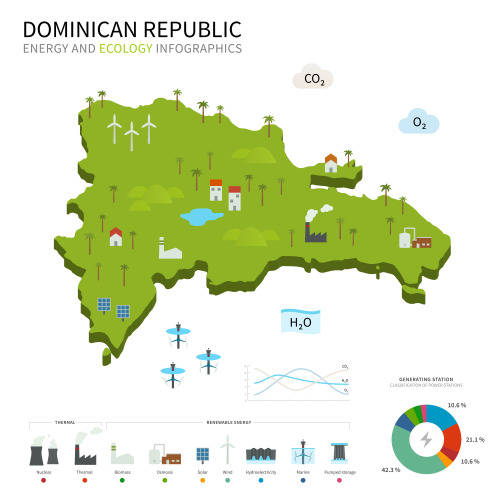 Infographic of energy usage in Dominican Republic (image courtesy of Brothers Good via Shutterstock). The report from the International Renewable Energy Agency, Renewable Energy Prospects: Dominican Republic, finds the country could increase the share of renewables in the power sector alone from 12 to 44 per cent by 2030. An estimated annual investment of USD $566 million in renewable energy is needed between now and 2030 to reach the 27 per cent renewables mark. But achieving this will actually result in a net annual savings of up to USD 5.3 billion annually by 2030 when accounting for factors like human health and reduced emissions. The report recommends a suite of actions to help achieve the country’s full renewable potential including setting clear and consistent renewable energy targets, designing appropriate incentives and market mechanisms, and conducting transmission planning and grid expansion, among other measures. The report recommendations, specifically the innovative approach to integrating variable renewables in the power sector, provide a model applicable for all islands. Download the report executive summary, available in English and Spanish here.